Brett T. Funck, a 1990 graduate of Rye Country Day School, was recently promoted from Colonel to Brigadier General in the United States Army. General Funck currently serves as the Deputy Chief of Staff in the United States Army Reserve Command with responsibility for all Army reserves worldwide. Previously, he served as the Chief of Staff for the 82nd Airborne Division, and before that, he commanded the Fort Bragg Garrison, the largest military base in the United States. His command at Fort Bragg has been likened to being mayor of a city with some 54,000 service members, civilian employees and their families. He oversaw all operations and services on the base, including a school system with 4,400 students. General Funck has had an outstanding and interesting career since being commissioned as an infantry officer at West Point in 1994. He earned a B.S. degree from West Point, a Master’s in Human Resource Management from the University of Michigan, and a Master’s in National Security Studies in Canada, where he was the only U.S. military officer selected for cross training in Canada’s National Security Program. He also attended the Command and General Staff College at Fort Leavenworth. His multiple deployments include Albania, Kosovo, Jordan, Afghanistan, and Iraq. He also headed a team on a special two-year mission that searched for servicemen missing in action as far back as World War II in Myanmar, Papua New Guinea, Laos, Vietnam, China, North Korea, and Europe. His many awards and decorations include the Legion of Merit, Bronze Star Medal, Purple Heart, a Master Parachutist Badge, and a Commendation for Valor. While a student at Rye Country Day School, he excelled in the classroom and was an ice hockey, lacrosse, and soccer star. He continued as a defenseman on the West Point Hockey team and still plays hockey on pick-up teams wherever he finds them on his travels. His mother, Priscilla Funck, was the school nurse at Rye Country Day until her retirement in 2013. 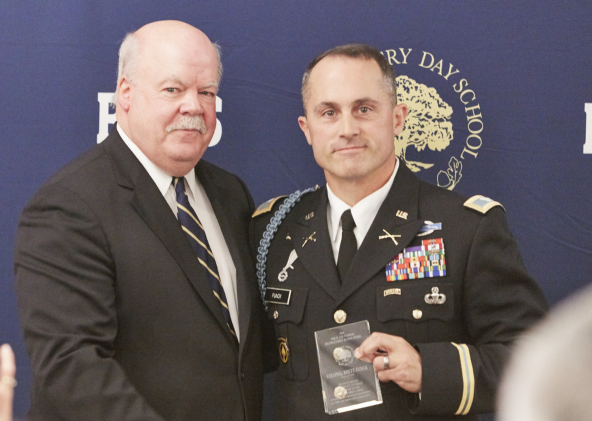 In 2016, General Funck was inducted into Rye Country Day’s Hall of Fame and awarded the school’s highest honor, the W. Lee Pierson Distinguished Alumni Award. The award has been presented annually since 1993 to an alumnus or alumna who has risen as a leader in his or her field and demonstrated exemplary service to the school and the community-at-large.